The Five of the Suit of Wands will more likely than most, mean that there will be arguments, trials, and struggle, and success will only be achieved after much striving. 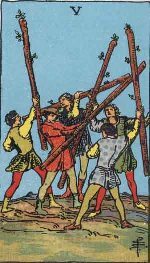 The Five of Wands or the Lord of Strife card indicates the struggle, strife, conflicts and discords that we often encounter in the achievement of our goals. This card comes up when a person is unhappy and sad because he is facing several handicaps in executing his projects which may relate not only to his business but may also involve personal relationships. This card also suggests that nothing can be achieved by entering into argument for argument sake. Often this situation arises because of our tendency for rashness and loss of self-control, which further engender more problems than solutions. The Lord of Strife card also appears when we are in a state of inner conflict, which arises when we look for easy solutions through immoral acts and are troubled by the voice of our conscience.